Flawless, unblemished and even-toned skin is something which everyone desires. However when your facial skin is marred by dark spots and discoloration, it naturally affects your self-esteem. Patchy skin and hyperpigmentation can be due to various reasons. Melasma also called as pregnancy mask occurs during pregnancy due to hormonal changes and it could persist even after your delivery. Other causes are due to post pimple marks, use of birth control pills, exposure to the sun without using proper sunscreen, freckles, age spots etc. Some types of discolorations can be due to burns and or bad habits such as pinching or plucking your skin or incorrect use of tweezers while removing facial hair. There are several ways to tackle hyperpigmentation from over the counter skin lightening creams to skin peels, to microdermabrasion to laser treatments. Some fading creams are reportedly unsafe and do more harm than good, especially the ones containing hydroquinone. It's better to get a cream prescribed by your dermatologist rather than trying some random cream after being lured by an eye-catching infomercial. If the discoloration is not severe, it's better to rely on home-remedies which are quite effective. One such DIY remedy is this Milk and Tomato Lepa. (In Ayurvedic parlance, topical applications on the skin are known as Lepa /Lepam ) All the ingredients that go into the making of this lepa are right there in your kitchen and and unlike the contents in the lightening creams, these are not harsh on your skin. The making process also doesn't take much of your time. Heat a pan and add 5 tsp of milk. To this add 1/4 tsp of turmeric powder and 3 tsp of tomato paste mixing all the while and on a low flame. Then add crushed coriander / cilantro leaves paste around 1 tsp to it and mix well. Switch off the flame and squeeze the juice of 1/4 lime in it. Now your Lepa is ready. Transfer it to a bowl. Apply this paste on your discolored or pigmented skin and let it remain for 15-20 minutes. Then take an ice-cube wrapped in a clean hanky and gently move it over your skin for 5 minutes. Rinse off with cool water. Do this for 2-3 times in a week for better results. However it is important that you stick with this treatment for at least a month or so and not give up midway and claim that it's not working for you. After using for 2 weeks or more, you'll notice a slight improvement and once you find that this particular lepam is working for make sure to stick with it. 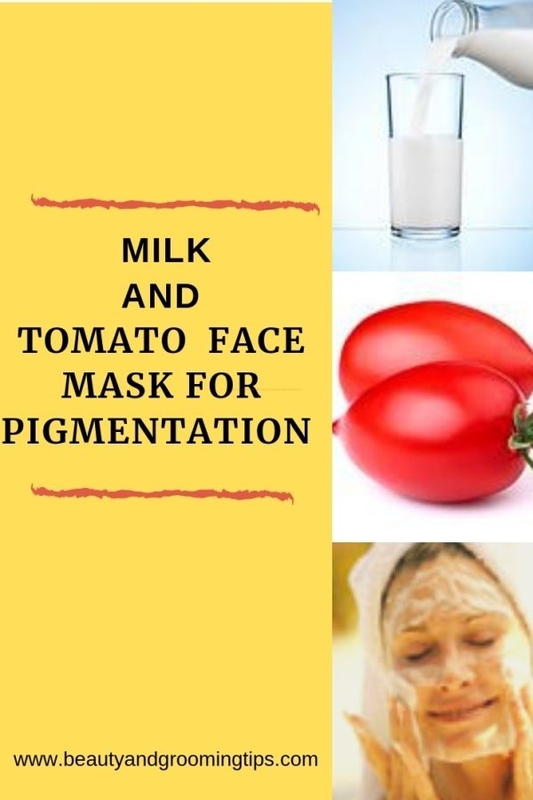 Hyperpigmentation does not go away immediately and it may take one or two months to fade the marks, lighten the skin and make it blemish-free. The main thing is that you shouldn't get disheartened and lose hope quickly or stop the treatment out of sheer laziness. By the way, when you are treating yourself, remember to protect your skin from the sun by using a sunscreen with adequate SPF. Sun damage will prolong your healing process or even worsen it. Take equal quantities of holy basil leaves and lemon juice and apply on the pigmentation marks, dark circles or pimples. This is an effective medicine. There are 2 main causes to hyper pigmentation, hormonal and long term sun damage. The main thing you need is to avoid sun exposure on face. Use a good quality moisturizer with a very high SPF every morning. Never lay in the sun or use tanning beds. Wear a big floppy outside and head for the shade.